Synopsis: Agnes, taken for granted as a suburban mother, discovers a passion for solving jigsaw puzzles which unexpectedly draws her into a new world – where her life unfolds in ways she could never have imagined. 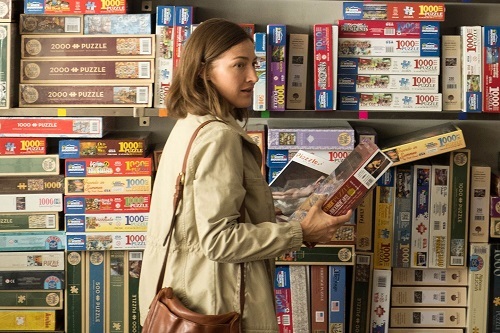 Puzzle is about a woman named Agnes (Goodbye Christopher Robin‘s Kelly Macdonald) who, while not unhappy, has led an unfulfilling life taking care of her husband, Louie (David Denman from “The Office”), and their two sons, Gabe (Austin Abrams from Paper Towns and Tragedy Girls) and Ziggy (The Ranger‘s Bubba Weiler). When she is given one as a gift for her birthday, Agnes discovers that she not only has an aptitude for jigsaw puzzles, but she has a passion for them as well. 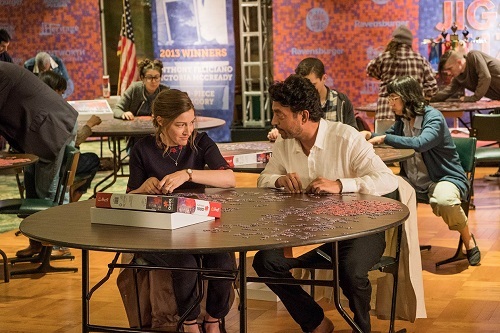 While purchasing a new puzzle, Agnes comes across a flyer from a competitive puzzle builder named Robert (The Lunchbox‘s Irrfan Khan) who is looking for a doubles partner. Agnes and Robert make a great team, and their partnership opens the introverted Agnes up to experiences that she would never have had otherwise. Unfortunately, not all of the experiences are positive. Screenwriters Oren Moverman (Love & Mercy, The Quiet Ones) and Polly Mann (her first produced screenplay) adapted Puzzle from a 2009 Argentine film written and directed by Natalia Smirnoff (Lock Charmer) called Rompecabezas. Essentially, director Marc Turtletaub (Gods Behaving Badly) has introduced American audiences to a charming story that would have probably otherwise gone unnoticed by them. And it is a very charming story. What Puzzle boils down to is a tale of a woman breaking free of the confines of her middle-aged lifestyle in order to find her true calling in life. Before she discovers her expertise at puzzle building, Agnes sleepwalks through life, and husband Louie is fine with her just accepting her rightful place as the family matriarch. Her arc of finding what she loves mirrors that of her son Ziggy, who works as a mechanic in Louie’s auto shop, but confesses to her that he secretly longs to be a chef instead. Sure, it’s a bit of pandering symbolism, but it ties the characters together nicely, and shows that Agnes is not alone in her slumbering auto-pilot existence. If there’s a knock on Puzzle, it’s that the plot is very obvious and by-the-numbers. There are very few surprises in the film, if any at all. 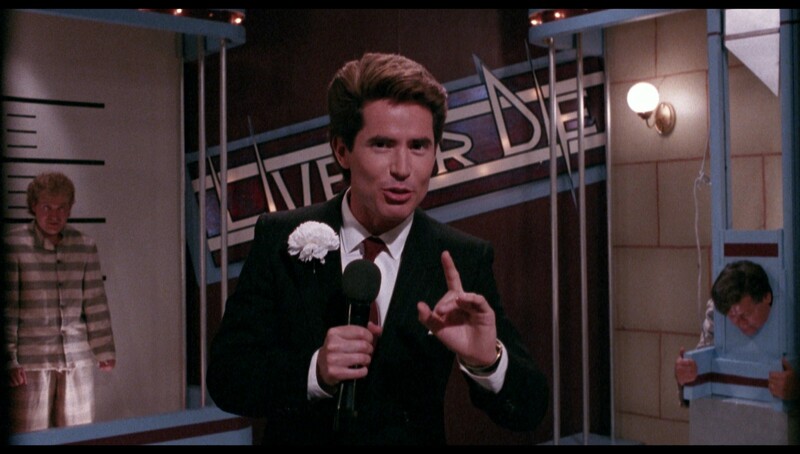 It goes pretty much where the audience expects it to go. It is by no means unwatchable, it’s just very predictable. It would have been fun to see it go to some unexpected places, even if those places are dark and unsettling. As it is, Puzzle is just an amiable little story about a woman finding her passion. And every piece fits the safe story cleanly. 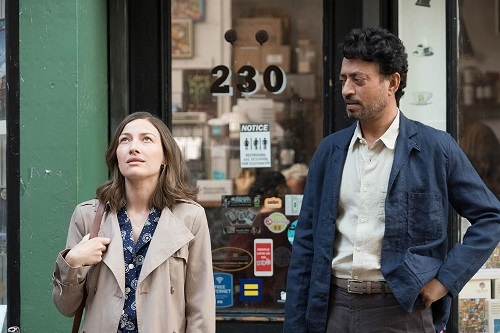 Part of the fun of Puzzle is watching the relationship between Agnes and Robert develop, and that falls squarely on the shoulders of Kelly Macdonald and Irrfan Khan. The chemistry between the two is not sexual, or even loving. It’s more like exactly what it’s supposed to be in the movie; they meet, and the audience gets to watch their friendship blossom and bloom. At first, they are awkward and tense, but once they get comfortable around each other, they open up and become very close very fast. Macdonald and Khan are able to use restraint and slowly build on the relationship, and it’s a joy to watch. Separately, Macdonald and Khan are good, but together, they’re great. It’s not the type of chemistry that lights up the screen, but it’s not supposed to be that way. There’s an organic and natural association between the characters, and the actors play it up perfectly.